Zappy Zappy Toy Toy - Let's Go! Wow. This has to be one of my favourite mixes all year - I'm currently listening on headphones and I look crazy, neck snapping and screw facing at a friends' house in sedate and rural Oxfordshire. 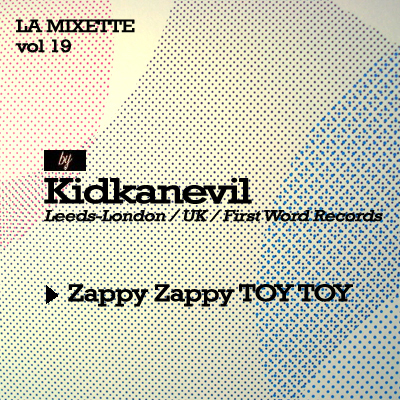 Producer/ DJ extraordinaire Kid Kanevil for Musique Large, this is the Zappy Zappy Toy Toy mix. Just in case you don't know about Kid Kanevil check out his single Megajoy/ Minjo from the new album Basho Basho the intro's a minute long but trust me it's worth it - I challenge you not to dance like a fool. Let's go!